Here's one way to look at it - you're learning how to write Chinese characters and want to learn increasingly big chunks of them, rehearsing them as you go. You start with A, then go with B, then there's already a sequence that is a pair of two so you combine it. Then you go with C and D, make another pair, practice it. Then you rehearse: ABCD. Then the same goes with E up to H, then rehearse: ABCDEFGH. The list is infinite. The goal is to generate and print out an n-th element of this list, indexes going up from zero. Assume that after 'Z', you get 'A' again. The winning criteria is source code length. Returns a list of non-wrapping integers. Based upon a construction by Donald Knuth. Related OEIS entry: A182105. This is a two-stage recursive function. During the second pass, we build the list \$[u_n-v_n,u_n-v_n+1,\dots,u_n]\$ and eventually return it. Or 91 bytes in lowercase. Based on Arnauld's use of Knuth's construction. The condition u&-u==v can be replaced with a simpler condition u/v%2>0, or alternatively u&v>0, since v is always a power of 2 that u is divisible by. Returns a list of integers instead of a wrapping string of alphabet. 0-indexed. Uses OEIS A182105, thanks to @Arnauld. 1-indexed. The TIO version has lim instead of ∞ to prevent crashes. Try it online! TIO link works well up to and including \$13\$. Full program. Prints ,-separated list of integers. Repeat the given number n times. Take the last element of u, which is the reversed nth element of the desired list, and implicitly print the reverse. Not the answer you're looking for? 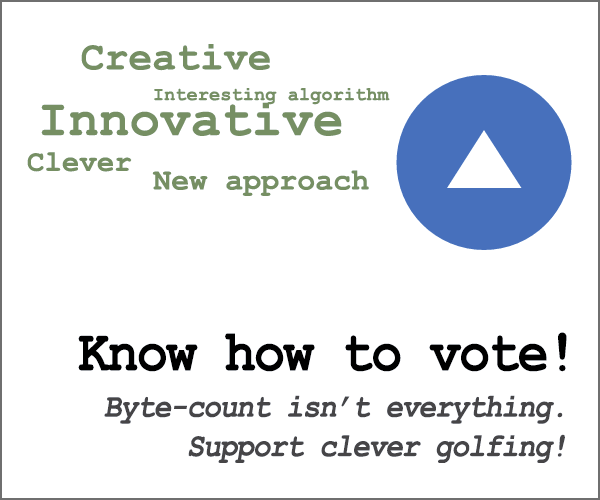 Browse other questions tagged code-golf sequence alphabet or ask your own question. Who's Going? Can you help me?